Rocks are being crushed while prospecting for gold. Metallic surface may be used or other larger rock surfaces. 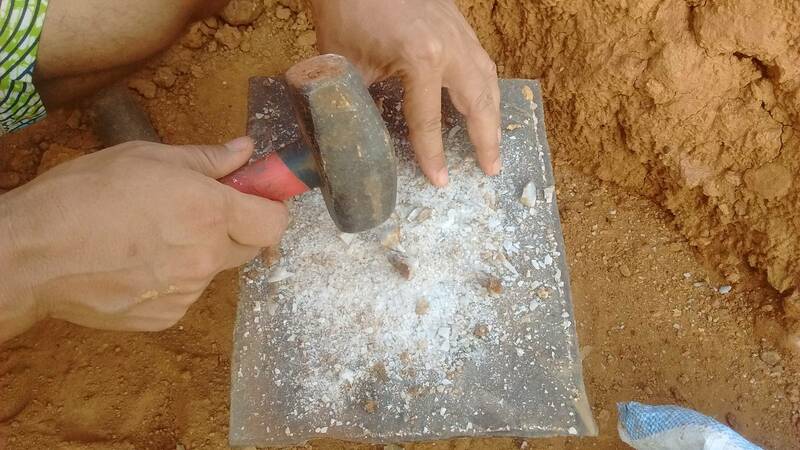 Care shall be taken to carefully wash the surface, the hammer, including the rocks to be crushed and basin and gold pans so to avoid the salting with previous gold particles. Artisanal miners in this area were of the opinion that rocks need to be dried before crushing, that is not true, and with the care you may crush even quartz without rocks flying everywhere around. Keep your eyes safe by using goggles. Keep your hands safe by using hand gloves. Do not try this at home without safety.